If you’ve been installing radiant heated driveways, roofs and gutter melting solutions for any length of time, you’ve most likely had to seek out ground fault equipment protectors (GFEP units) with breakers to properly install these systems. 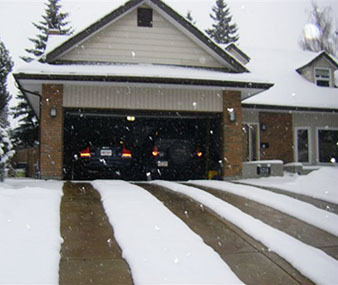 Traditionally many companies sell complete heated driveway systems to qualified, licensed electricians and installers; however, these customers are still instructed that they must find GFEP units with breakers to properly install their system. Warmzone has always emphasized this need, but now, things are changing. 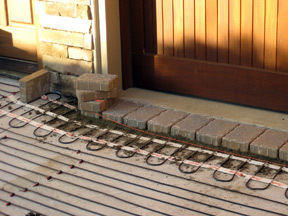 In keeping with its commitment to provide professional builders with the best products, service and convenience, Warmzone radiant heated driveway systems now include GFEP (ground fault equipment protection) breakers with its panels, saving you time and money. If you’re an electrician or an installer, shopping Warmzone means you don’t have to scramble to track down these breakers for an installation. You’ll get just the right GFEP and breaker for the job. What is a ground fault protector, and why is it so important to a heated snow melting system? Basically, a ground fault is an electrical event caused by an insulation loss between a live conductor and an exposed conductive part that causes flow of current to the ground. (In the case of a heated driveway, the conductive part of a heated driveway is the heat cable.) This electrical event may cause serious problems to radiant heated driveway electrical systems and equipment, as most short circuits can start as undetected ground faults. A ground fault equipment detector or GFEP is a device that is intended to protect heated driveway equipment against damaging line-to-ground currents, as are those emitted by electric radiant heat cable, by disconnecting all un-grounded conductors of the faulted circuit. By adding a ground fault equipment protector (GFEP) to a snow melting system, you can detect ground faults immediately, preventing serious damage to heated driveway system components. The NEMA 4 wall-mounted control panels are rated for outdoor usage and the controller has proven itself as a trusted industry leader. The UL and CUL listed control unit automatically controls gutter and downspout snow and ice melting heaters, and includes the GFEP (ground fault equipment protection) required by the NEC. The unit can also be controlled from an external signal (day/week timer, GSM-module or other signal source). 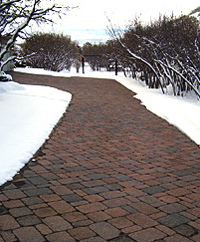 The state-of-the-art components result in providing the best possible performance for heated driveways, roof deicing, and gutter and downspout heating. Contractors are hailing this advance offered by Warmzone. Ground fault equipment protection included in the Warmzone panels ensures cost savings, convenience, and increased reliability and safety in all your heated driveway installations. To find out more about purchasing a Warmzone snow melting system features a GFEP, call 888.488.9276. Are you taking care of those who take care of you? Rather, are you taking care of your roof? While it’s natural to not give your roof or gutters a second thought, be sure to take whatever steps you can to protect your roof and enhance its lifespan. One way to do this is by installing an electric roof deicing system. 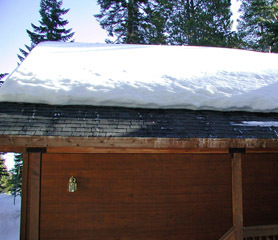 Roofs and gutters in cold weather climates can suffer damage from heavy snow and ice. 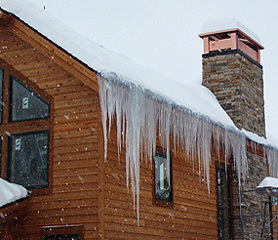 Ice dams are the most common problem responsible for expensive roof and water damage. Heat rises from the house and attic, warming the roof and melting snow, which then trickles down towards the roof’s edge. But when the runoff reaches the cold eaves, it refreezes and forms the beginnings of an ice dam. This process repeats and as more snow melts it begins to pool behind the band of ice that has formed on the eaves. Water from this pool can seep into cracks and enlarge them as it refreezes to eventually form a path down into your home. Shingles can even come loose due to the contractions and expansion from the change in temperature. This constant barrage on your roof can lead to water damage and cause mold and mildew growth. The water is often undiscovered until significant damage has occurred, and repairs can be very costly. Warmzone radiant roof heating systems quickly melt heavy ice and snow from gutters and trouble spots on your roof. They can be easily installed in existing roofs to prevent icicles, ice buildup and ice dams from occurring. Moisture buildup from ice dams can seep up under shingles and into the roof decking before making its way into your home and causing significant water damage. A roof and gutter in need of a roof heating system.A variety of roof heating solutions are available, as well as roof gutter melt systems. Warmzone’s durable RoofHeat self-regulating heat cable is extremely effective and energy efficient. Noted for its versatile characteristics, RoofHeat radiant self-regulating gutter heating cable is one of the most recommended roof heating solutions available. The systems are easy to install and easy to customize. And these roof heating systems are fully automated, so snow removal is extremely convenient. Simply install it and know that your roof is protected. For more information on radiant roof heating or snow melting systems for your home, call 888.488.9276. Winter is supposed to be colder and snowier than ever this year. If you’re living in the snow belt, you can meet the snowy weather with a solution that’s sure to make your winter much more bearable. From installing radiant heated floors to heated driveways and roofs, Warmzone makes the process of tackling a radiant heating project much easier. Before installing any heat cable, it’s important to know the ins and outs of radiant heat installation to maximize the performance of your system and ensure that the warranty remains valid. In addition to Warmzone’s free consultation and installation support, a wealth of information is also available online in Warmzone’s radiant resource center, where you can find articles, installation manuals and related information. Cable Care – Extreme care must be used to ensure the cables/mats are not damaged when using sharp tools, wheelbarrows, shovels, rakes or heavy machinery. Check Supply Voltage – Make sure that the supply voltage matches the voltage required for your specific snowmelt product. Never cut the Heat Cable – Heat cable is resistance cable. When it is shortened it increases the wattage per foot of the cable. Altering the cable in this way can void the warranty and cause the heat cable to fail due to over-temperature. Laying out Heating Mats – Unroll the heating mat on to the area you want to heat. Fasten the heating mat to the mesh reinforcement using tie-wraps, zip ties or cable strapping. Do not cause the heating cable of the mat to be compressed or strained. Do not let Cables Touch – Never allow the heating elements to cross, overlap or touch. Embed the Cable – Whether you’re installing in concrete, asphalt or pavers, make sure that the cable is completely embedded under the surface. If uncovered, it can malfunction in the area of exposure. Embed the Power Lead – The power lead/heating cable splice and at least 6 inches of the power lead must also be embedded in the paved surface. The remaining power lead should be run through a conduit. Making Turns with Mats – Heating mats can be altered to accommodate drains, obstructions or bends in the layout. To make turns or alter the spacing of the heating cables in mats, only cut the tape – NOT the heating cable. Ground Sensor Placement – The ground sensor must be placed between the heating cables within the heated area at least 3.3 feet (1 m) from the edge of the area. A minimum distance of 0.41 inches (1 cm) should be maintained between the sensor tube and the heating cable. Aerial Snow Sensor Placement – Aerial sensors should not be placed under eaves but where there is direct exposure to the open sky. Avoid areas that will have delayed or false readings. Remember, Warmzone includes free installation support with your heated driveway system, so if you have any questions, call a radiant heat expert at 801.948.7577. What does it take to become an industry leader in the radiant heat business? As an industry leader of radiant heat solutions, Warmzone has set the gold standard. Built on top quality products, superior customer service and solid manufacturer warranties, Warmzone is always innovating, testing and developing new and better products for customers. Of course, shopping Warmzone gives customers the assurance they are buying the most proven and advanced radiant snow melting solutions, at truly competitive prices. Warmzone has been around for a long time, and has forged relationships with radiant heat manufacturers and installers across the country. They also maintain bragging rights to an impressive group of in-house radiant heat consultants, staffers who have been entrenched in their business with a strong command of everything radiant heat related. Warmzone holds its products to ASHREA industry standards, creating a good foundation for great radiant heat solutions. Adhering to these standards is all about breaking it down regionally—examining the weather, climate, average snowfall, temperatures, and other factors that play a role in overall system design to ensure each system is optimized for its location. Warmzone designs custom systems in accordance with these standards for consumers throughout the U.S. and Canada. Warmzone further differentiates itself with outstanding customer service. From free installation training to personal, expert installation support, Warmzone is there every step of the way to assist you through the installation process. Systems are designed to meets customers’ snow melting and budget needs. And the wide selection of products and systems ensures each customer will receive the ideal solution for their snow melting needs. Offering complementary system design services and installation support are other reasons why builders continually deal with Warmzone. Warmzone radiant heat experts thoughtfully consider all of their customers’ system requirements to design systems on a case by case basis. Customers receive a detailed layout (AutoCAD if requested) that includes critical power requirements and specs prior to any installation. This helps to ensure that there are no “surprise” expenses and that your system is installed correctly. There’s a whole lot more to talk about, but one thing is clear—Warmzone continues to stand on its own as an industry leader in radiant heat solutions for both residential and commercial customers. For the most innovative radiant heat systems, free installation training, helpful customer support, comprehensive design and installation services, contact Warmzone at 888.488.9276.